Both on stage and off he is leading the company into their Fall concert series, “My Past / Our Present”. Cerqua Rivera Dance Theatre has been growing like a wildflower in the past few years. They have established a unique and resonant identity that has captivated Chicago dance audiences. With such uninhibited growth, the advent of new roles within the company, such as a Rehearsal Director, became paramount. That is where our friend Brennen Renteria comes in, a veteran company member with CRDT and now Rehearsal Director too. Both on stage and off he is leading the company into their Fall concert series, “My Past / Our Present”, which will be performed in three Chicago locations this October (Oct 5-6 at 8pm at Studio5, Oct 19-20 at 7pm at Links Hall, and Oct 27 at 7:30pm at The Logan Center. The series features some very exciting collaborations, and a new addition to the American Catracho suite by artistic directors Wilfredo Rivera and Joe Cerqua. Wilfredo and I had several talks about what lies ahead for the company. He shared with me his intention to continue evolving CRDT as an organization and the ambitious plans he has for the future. I could see how passionate he was about making this into a reality. I became adamant about helping to guide the company towards this vision. Crystal Gurrola: Cerqua Rivera Dance Theatre has grown tremendously in the past few years. Could you tell us first, what your role as Rehearsal Director entails and then, how your role has and continues to contribute to the company’s growth? Brennen Renteria: Cerqua Rivera Dance Theatre has undergone quite an evolution recently and is now poised to occupy and embrace a vacancy in the Chicago dance scene. For us, the challenge has been reformatting a model that the company has outgrown and restructuring as we continue our expansion with our 19th season. At the end of last year’s season, Wilfredo and I had several talks about what lies ahead for the company. He shared with me his intention to continue evolving CRDT as an organization and the ambitious plans he has for the future. I could see how passionate he was about making this into a reality. I became adamant about helping to guide the company towards this vision. At this time, the Rehearsal Director title was newly created and its role within the organization had not been fully defined. My goal when taking on this position was to make it equally active between the staff and dancers of the company in order to be a liaison between the two and strengthen internal communication. Of course, the fundamental role of a rehearsal director is to manage and facilitate rehearsals to equip and prepare the dancers for company shows. As this season has progressed, other tasks and responsibilities have found their way into my hands as well. These include having a more prominent role in scheduling of choreographers and guest instructors for company class, managing the digital mocks or recordings of our music for rehearsals and smaller performances (for when do not bring the band), recording runs of pieces for notes or to keep a catalog, acting as a link for the music composition to make its way into the rehearsal process, assisting in management and artistic decisions, and many other little things that pop up in order to keep this organization sailing at full speed. Lastly, one ongoing aspect to being a rehearsal director is understanding that you are an ambassador for Cerqua Rivera Dance Theatre at all times. I have been acclimating to this position while also continuing as a member of the dance ensemble. All of the ensemble dancers have been a tremendous help in providing me with feedback and helping to keep me on track as we iron out our new structure for the organization. Some have even stepped in to offer assistance with things such as costume management or helping us network with dance education programs and even dancer wellness programs as the staff is still growing to meet the company’s many new needs. 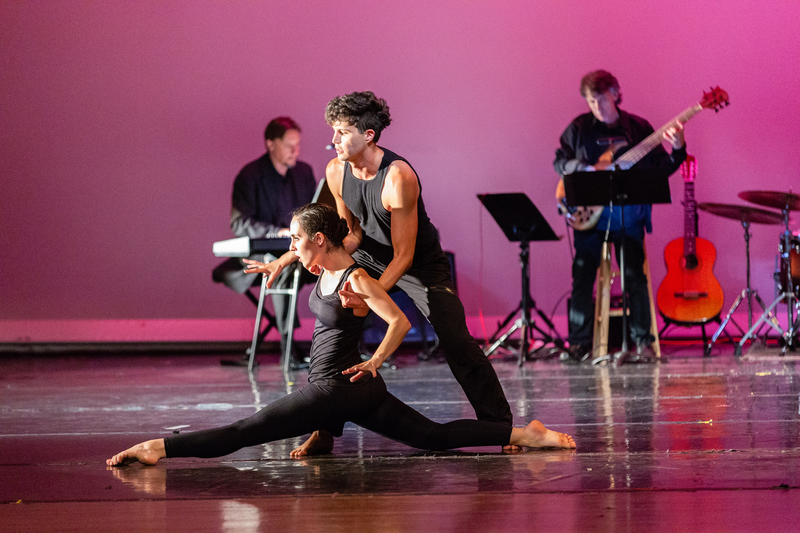 Contributions such as these have also helped drive CRDT’s growth as we continue to organize ourselves as a unique repertory dance and music company with deep roots within Chicago. Every piece that the company presents is the result of months, sometimes years, of dialogue between Wilfredo and the choreographer. They spend so much time researching, brainstorming, and imagining together so that by the time the in-studio process begins, the vision for the piece is already so rich. Crystal: CRDT is undoubtedly a unique presence in the Chicago dance community. The resident jazz ensemble that accompanies every performance, a component as vital to the company as the dancers themselves, is the element that most people would recognize as unique. What else in your experience makes this company a stand out and a company you are proud to be a part of? Brennen: Not only does our resident jazz ensemble perform live with us at every concert, several of the musicians compose our entire set, often working hand in hand with the choreographers to provide them with an original score for their work. However, I believe that our strongest sense of identity as a dance organization has to be what we have to say in our work, the message we wish to share with everyone. Every piece that the company presents is the result of months, sometimes years, of dialogue between Wilfredo and the choreographer. They spend so much time researching, brainstorming, and imagining together so that by the time the in-studio process begins, the vision for the piece is already so rich. I feel that this helps to provide a stable foundation for all of the work that we present so that the dance, music, and experience all share purpose and soul stemming from this enriched platform. This is what we wish to share with our audiences, and it is here that CRDT finds its voice within the community. There could not be a more critical time for this work to be unveiled and to advocate for those in need of help. Crystal: American Catracho has become a buzzword in Chicago dance. It’s a name with longevity and potency; it is a masterwork that began in 2016, when you first joined the company, and is slated for completion in 2019. Being the only original cast member of this ongoing project, could you give us some insight into the process? How has it taken shape? Who is involved and how? Why is it so relevant? Brennen: Actually, there are no original cast members from the first year of American Catracho that still dance for CRDT! However, I learned and performed the 2016 composition with most of the original dancers during my first couple of months after joining the company so I am familiar with the work to an extent. Firstly, American Catracho is a pursuit to illustrate what it means to leave your home and everything that you know behind you in hopes of a better future. It explores the many facets of what brings an individual or a family to make this choice, either willingly or forcefully, and what the journey can be for them along the way. In our world today, this can be the driving force for many who have moved to the United States searching for a better life. Their stories can be fascinating, horrific, passionate, and bewildering, but these stories are lesser known by us and often not understood. This is one of the major inspirations behind the creation of American Catracho, which speaks for the stories that have not been told. This is a work that has long been in the works for Wilfredo, who is an immigrant himself. For three years he has been working with several professionals who work with those who need assistance in adapting to life in this country, many of who are children. He has hired movement consultants to choreograph a vast majority of the work based on his research and will be fully realized next year. With the state of our nation at the moment regarding immigration policy and the disregard for the arts and art organizations such as ours, from a political standpoint, there could not be a more critical time for this work to be unveiled and to advocate for those in need of help. All of the ensemble dancers have been a tremendous help in providing me with feedback and helping to keep me on track as we iron out our new structure for the organization. Crystal: What has been the highlight of this season so far for you? What are you most looking forward to in the remainder of this season? Brennen: Dance for Life 2018 was certainly a highlight for me. Although I have been a part of that show in the past, it was thrilling to be presented as an ensemble among Chicago’s most elite dancers. We also performed a little TV segment the prior weekend to help promote the show. Another exciting event from this season was when we helped open the Chicago Dance Month celebration at the end of March with several other dance companies. As for the rest of the season, the fall concerts will definitely be incredible. We also have a benefit concert while we are at Link’s Hall with a special reception planned following the end of the show! Crystal: CRDT has a great lineup of performances coming up in October. The performance venues stretch across the main corners of Chicago, opening up access for more people to see dance. What do you think the audiences will take away from these performances and what will keep them coming back? Brennen: I think that one of the reasons that people go to see dance performances is because they want to have a multi-sensational experience that they can connect to. There is so much beauty to bodies in motion that dance is inherently a draw to the eye, regardless of whether it is choreographed on the Mariinsky Ballet or simply your uncle dancing to his favorite song at a family party. When you come to a CRDT concert, not only is there live dance and live music, but there is a live spirit as well. I think that this spirit will be inexplicably captivating to our audiences. With our shows themed to reflect the happenings of the world around us today, I truly hope that the audience will feel connected to the works and that the spirit driving the arch of the show will resonate within them on a personal level. What they take away from this experience is up to them, but hopefully, they like it and will come back to see us again! When you come to a CRDT concert, not only is there live dance and live music, but there is a live spirit as well. NOTE: October 19 is a Benefit Performance. Special tickets required. Crystal Gurrola is a dancer and choreographer. She has danced in Chicago, New York, and Japan, and is a Company Member with Hedwig Dances.